Pots with purpose! Utilitarian stoneware created to offer both a visual and tactile experience. I love to enhance many of my pieces with carvings prompted by nature’s artistry. All glazes used are lead-free, microwave and oven safe. Directions: From Main Street in Andover, Route 21, turn East on Center Street. Turn right at the first stop sign, Church Street and then make the first left onto Pleasant Avenue. Continue toward the end of the street. My home is the brick one on the left with a wrap-around porch. I make hand-thrown, high fired pottery. I specialize in functional pieces and dinnerware. I have a wide variety of beautiful colors which are lead free and oven safe. Directions: I am located on Route 19 two miles south of Belmont. Look for brown house with a red metal roof. You can’t miss it. All my pieces are one of a kind, decorative as well as functional clay works. I gravitate to classical forms coupled with expressionistic surfaces and colorful glazing. Most are assembled from thrown forms but will use any method or prosess that achieve the ideas I have at the time. Directions: Coming from Wellsville, East on State Route 417, 7/10 of a mile past Elm Valley (County Route 12 intersection) continuing on to Andover. #2084 House/Studio are on the left side of 417, Clay / Grey color. High fired stoneware and porcelain pottery. Directions: From downtown Alfred (Main Street), turn onto Church Street. Continue on Church Street about 1.2 miles (street name changes to West University and then to Waterwells Road). Turn left onto the first driveway past Oak Ridge Road. Driveway flanked by large mail box. Fine handcrafted stoneware pottery. Kitchen and tableware a specialty. New glazes and forms along with old favorites. Special orders are welcomed. Directions: Route 19 to blinking light in Fillmore. Take route 4 to Ballard Road on the right. 1 mile on Ballard and turn left onto Schucknect Road. 2 miles to the end. At the “T” make a right turn onto Dutch Hill Road. Pottery is on the first driveway on the right. Functional Pottery - Leafy bowls, vases and cups that are all one-of-a Kind and made for food and flowers. They appeal to those who love nature, gardening, arranging flowers or serving in a special dish. Directions: From the only traffic light in Alfred, take South Main St. (County Route 12) south for 1 mile. Turn right onto Randolph Rd. (sign says “Light House Ministries”) Go 1.2 miles. Alternatively coming from the south on County Route 12 at top of Jericho HIll, turn left onto Lake Rd. (notice “Equestrian Center” sign) Go one mile. Turn right onto Randolph Rd. and go 0.3 miles. I’m back this year. Who knows for next year? Lots of mugs as usual, plus new and “vintage” work. Visit a long-time, professional “Alfred” potter and enjoy great refreshments. Directions: Take County Route 12 south from Alfred village center. Go 2 miles up “Jericho Hill” from business block. Turn left onto Kenyon Road. Studio is 0.2 miles on the left. My work puts the fun in functional! What I enjoy most is the challenge of the teapot. I make teapots of all kinds. All are functional and all show my sense of humor. If you are a serious teapot collector, my studio is not to be missed. Directions: From Main Street in Alfred, turn west onto Route 244 and go ½ mile. House & studio are on the left, just past the Alfred State farms. If you come to Terbury Road, you have gone too far. Honest, useful pottery. Colorful and beautiful with some whimsy mixed in. 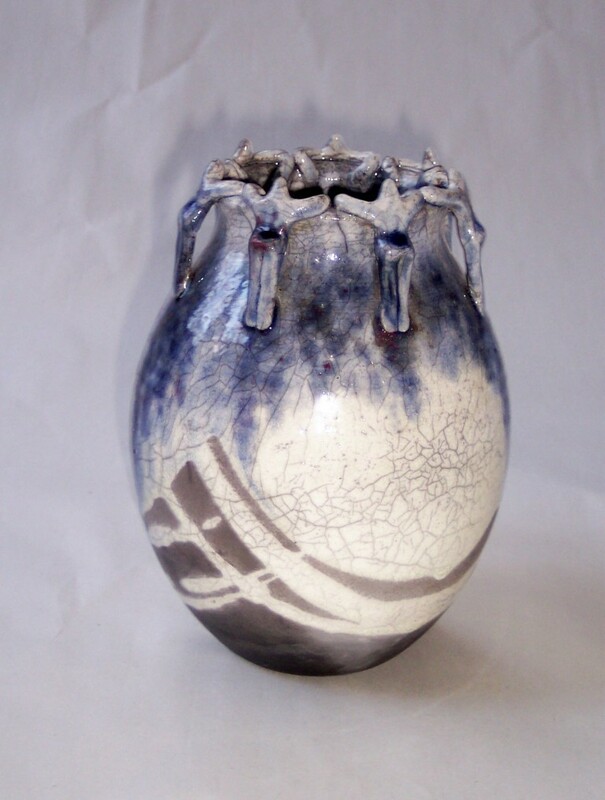 The work is in high-fire stoneware and Raku. I will be demonstrating Raku firing if the weather permits. Again this year, I have steam punk ray guns. These are one-of-a-kind mixed media sculptures. Directions: Take State Route 19 into Wellsville, turn west onto West State Street, turn left onto Highland Avenue. Turn right onto Pine Street/Niles Hill Road to a white house in evergreens, 2/3 of a mile on the right. Hand-thrown pottery made for your everyday use or special occasions. My intricate designs are captured in porcelain for functional ware with an understated elegance. Directions: At the south end of Houghton on State Route 19 turn up Tucker Hill Road. Go to the “T” meeting Wesley Road (about 2 miles). My home/studio will be right in front of you. I have been working with clay for over 30 years now. Cone 6 dinnerware, organic and brilliantly colored. New gas kiln with firing to Cone 10 in reduction. LOVING THE FIRE!!! Thrown and hand built pottery typically in stoneware. Many pieces are one of a kind or similar with a twist. You will also find wall and yard art all made with happy hands. Durable, dishwasher and oven safe. Lead free glazes. Directions: New location: 29 West Main Street, Angelica,NY. Come visit our new larger studio just 2 doors down from old location. Exit 31 from I-86. Turn toward village and take 2nd left onto East Main Street. Go around Park Circle to West Main Street. We are located in the building with the brick front, 7th up from the Post Office. Functional, sometimes funky but always fun! Come visit our new, larger studio just 2 doors down from our old location. Directions: New location: 29 West Main St, Angelica. Exit 31 from I-86. Turn towards village, take 2nd left onto East Main Street. Go around Park Circle to West Main Street. We are located in the building with the brick front, 7th building up from the post office. Terracotta bakeware created from Alfred Shale Clay once owned and used by the former Ludowicii-Celadon Roof Tile Company founded in 1889. We dig our own shale and with nothing added but water we create an all natural pure red-clay body for a long lasting piece that can withstand decades of heavy baking with simple care. Directions: On Route 21, which is Main Street in Andover, NY. Next to the Keystone Gas Station. Clay in many ways. I work with cone 6 porcelain to low fire raku and saggar firing. My work includes art pots and wall pieces, garden totems, sculptures and functional ware. Come see what's new! Directions: Travel east on Route 248 through Whitesville. When Route 248 makes a sharp left, go straight on County Road 19. Drive 1 mile. Studio is on the left.